Stressed By How Your Partner Conveys His or Her Love? This Book can Help! Since it’s the week of love and romance, I thought I’d add another book recommendation. 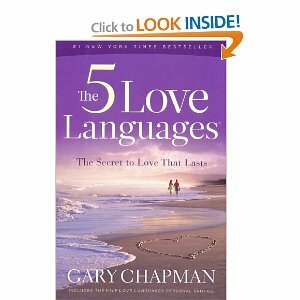 Years ago someone told me about this book, The 5 Love Languages, by Gary Chapman. It helped me better understand that everyone ha a different approach to expressing their love and caring for another person. In my Valentines Day post, I talked about how some people feel love when you take care of them others feel loved when you spend money on them. What does this have to do with Wellness? Think about the stress you have when you think you are showing your love and your partner thinks you are being insensitive. All because you don’t understand each others styles of showing affection and care. Stress can cause a lot of health issues. So, giving you tools to reduce stress is part of my goal! If you are in the perfect relationship and understand you partner 100% or even 90%, kudos! For the rest of the population, though, cultural differences, family experiences and personal history can affect how we view acts of love. This book is easy to read and insightful. Give it a read and let me know what you think of it! Unhappiness in marriage often has a simple root cause: we speak different love languages, believes Dr. Gary Chapman. While working as a marriage counselor for more than 30 years, he identified five love languages: Words of Affirmation, Quality Time, Receiving Gifts, Acts of Service, and Physical Touch. In a friendly, often humorous style, he unpacks each one. Some husbands or wives may crave focused attention; another needs regular praise. Gifts are highly important to one spouse, while another sees fixing a leaky faucet, ironing a shirt, or cooking a meal as filling their “love tank.” Some partners might find physical touch makes them feel valued: holding hands, giving back rubs, and sexual contact. Chapman illustrates each love language with real-life examples from his counseling practice. How do you discover your spouse’s – and your own – love language? Chapman’s short questionnaires are one of several ways to find out. Share Your Love this Valentine’s Day–It’s Good For Your Health! 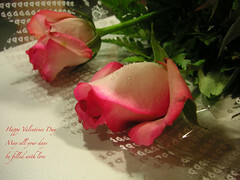 Valentine’s Day is a day when couples give each other cards, flowers and candies to show their love. It’s also a day that many of my singles bemoan their lack of a romantic partner. Instead of making Valentine’s Day a day to sulk about and envy romantic couples, friends of mine and I decided to make it a day for giving to others. We bought a bunch of pink carnations and a friend and drove around the city, looking for lonely people to give flowers to. We gave some to an old woman on a park bench, to single moms with strollers, to a workman repairing the street, to a homeless man. Giving away the flowers made us feel good and hopefully brightened the day of some people that may not have had anyone else showering them with affection. Humans are wired for connection, and when we cultivate good relationships, the rewards are immense. But we’re not necessarily talking about spine-tingling romance. “There’s no evidence that the intense, passionate stage of a new romance is beneficial to health,” says Harry Reis, PhD, co-editor of the Encyclopedia of Human Relationships. “People who fall in love say it feels wonderful and agonizing at the same time.” All those ups and downs can be a source of stress. It takes a calmer, more stable form of love to yield clear health benefits. “There is very nice evidence that people who participate in satisfying, long-term relationships fare better on a whole variety of health measures,” Reis tells WebMD. The Health and Human Services Department reviewed a bounty of studies on marriage and health. One of the report’s most striking findings is that married people have fewer doctor’s visits and shorter average hospital stays. According to the Health and Human Services report, getting married and staying married reduces depression in both men and women. This finding is not surprising, Reis says, because social isolation is clearly linked to higher rates of depression. What’s interesting is that marriage also contributes to a decline in heavy drinking and drug abuse, especially among young adults. A happy marriage is good for your blood pressure. That’s the conclusion of a study in the Annals of Behavioral Medicine. Researchers found happily married people had the best blood pressure, followed by singles. Unhappily married participants fared the worst. “It’s marital quality and not the fact of marriage that makes a difference,” Reis tells WebMD. This supports the idea that other positive relationships can have similar benefits. In fact, singles with a strong social network also did well in the blood pressure study, though not as well as happily married people. When it comes to anxiety, a loving, stable relationship is superior to new romance. Researchers at the State University of New York at Stony Brook used functional MRI (fMRI) scans to look at the brains of people in love. They compared passionate new couples with strongly connected long-term couples. Both groups showed activation in a part of the brain associated with intense love. The fMRI study reveals another big perk for long-term couples — more activation in the part of the brain that keeps pain under control. A CDC report complements this finding. In a study of more than 127,000 adults, married people were less likely to complain of headaches and back pain. If love helps people cope with pain, what about other types of stress? Aron says there is evidence of a link between social support and stress management. “If you’re facing a stressor and you’ve got the support of someone who loves you, you can cope better,” he tells WebMD. We’ve seen that loving relationships can reduce stress, anxiety, and depression — a fact that may give the immune system a boost. Researchers at Carnegie Mellon University found that people who exhibit positive emotions are less likely to get sick after exposure to cold or flu viruses. The study, published in Psychosomatic Medicine, compared people who were happy and calm with those who appeared anxious, hostile, or depressed. The power of a positive relationship may make flesh wounds heal faster. Researchers at Ohio State University Medical Center gave married couples blister wounds. The wounds healed nearly twice as fast in spouses who interacted warmly compared with those who demonstrated a lot of hostility toward each other. The study was published in the Archives of General Psychiatry. A growing body of research indicates that married people live longer. One of the largest studies examines the effect of marriage on mortality during an eight-year period in the 1990s. Using data from the National Health Interview Survey, researchers found that people who had never been married were 58% more likely to die than married people. Marriage protects against death by warding off feelings of isolation. “Loneliness is associated with all-cause mortality — dying for any reason,” Reis says. In other words, married people live longer because they feel loved and connected. It may seem obvious that one of love’s greatest benefits is joy. But research is just beginning to reveal how strong this link can be. A study in the Journal of Family Psychology shows happiness depends more on the quality of family relationships than on the level of income. And so we have scientific evidence that, at least in some ways, the power of love trumps the power of money. If you are depressed or anxious, get treatment. Brush up on communication skills and learn to handle conflict. Do things that are challenging and exciting with your loved one on a regular basis. To read the entire article at WebMD, click here. For a bit of history of Valentine’s Day check out this site, History Made Everyday, here.